Events following the US government’s closure of anonymous online marketplace Silk Road are beginning to further demonstrate the determination of the American authorities to put an end to outlets for illicit trade by use of virtual currency. During the later hours of Friday last week, federal officials announced the seizure of $28 million worth of bitcoins from an individual who is considered highly likely to be the owner of Silk Road, making this the highest amount of virtual currency ever to have been seized by authorities surrounding allegations of its usage for the purchase and sale of illicit goods and services via online anonymous market places, thus contravening federal law. Ross Ulbricht, who operated online under the alias “Dread Pirate Roberts”, was arrested early this month and is likely to face charges for a multitude of offences including conspiracy to commit drug trafficking and money laundering. At the time of the government’s seizure of the Silk Road website, US authorities confiscated $3.6 million worth of Bitcoins, at the time equating to the amount of 144,336 BTC, which was discovered at Mr. Ulbricht’s home stored on computers and various hard drives. Court documents indicate that an amount close to $1.2 billion worth in the crypto currency has exchanged hands since The Silk Road began operations back in 2011. As virtual currency, and in particular Bitcoin continues to gain popularity among mainstream users, and the US authorities have made it more than clear that its use as a form of underground payment mechanism for contravening the law is unacceptable. Litecoin marketplace Atlantis voluntarily ceased operations just days before the US government’s seizure of Silk Road, after just six months in operation, and with the disgorgement of such a large sum from Silk Road’s alleged owner, a clear message is being sent out. Far from generating an image as an outlaw currency however, these events appear to be strengthening the legitimacy of Bitcoin as a real, viable alternative to fiat currency. The mainstream usage is increasing, and in the case of nations such as Argentina and Canada, somewhat booming. Infrastructure is now appearing, and in the case of Argentina many retail outlets, restaurants and cafes accept Bitcoin as a method of everyday payment. In Germany, Bitcoin deposits, investments and withdrawals are able to be conducted within a regulated online bank, thus integrating it into the traditional banking system, and today in Canada, it has been announced that the world’s first Bitcoin ATM will go into service. Canada, a nation where Bitcoin has gained a considerable following, will be host to this ATM service next week in the British Columbian city of Vancouver. The software update for the ATM has been provided by Robocoin a manufacturer from Nevada and Bitcoiniacs, a local broker and operator, and will cost $18,500. 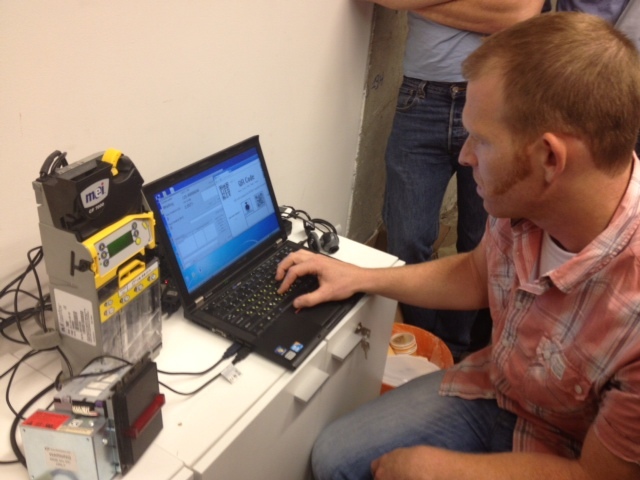 The ATM in Vancouver will be the first among the five Bitcoin ATMs scheduled to be deployed across Canada. Waves, the downtown café in Vancouver, is set to be the inaugurator of the service. Howe Street café Waves hosts CoinFest meetings where Bitcoin enthusiasts get-together on a regular basis. The digital currency has already started growing in popularity among Canadians. The daily limit for each user will be $3,000 (Canadian). The Bitcoin ATMs will be based on palm scan technology to identify the users and enforce the daily financial limit. The same technology will be used for preventing problems related to laws against money laundering. Following the implementations in Vancouver, other Canadian cities such as Calgary, Toronto and Montreal are likely to receive Bitcoin ATM installations, whereby deposits and withdrawals can be made in Canadian dollars. The technology behind such systems is becoming a talking point among Bitcoin enthusiasts. Forex Magnates attended a Bitcoin Meetup in Tel Aviv, Israel early this month at the Google Campus, where a Bitcoin ATM was demonstrated in operation. Its dimensions were compact, and it was connected to a standard laptop computer where it can connect to user accounts and conduct transactions. 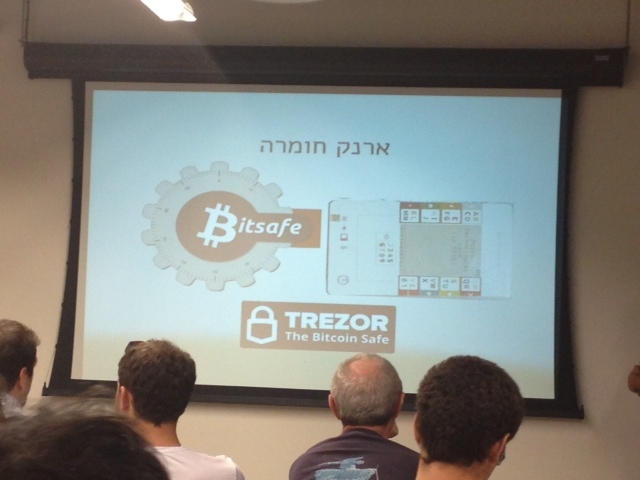 Security of e-wallets was a major part of the discussion at this particular Meetup, with host Yoni Jah and Meni Rosenfeld explaining that all keys to cloud-based wallets are a different shape and specific to each blockchain. Mr. Jah explained that there is an increasing concern over security, and that using authenticators such as Bitsafe and Trezor is now a method of ensuring compatibility with ATMs and ease of use, as a type of card is required to access them, which can also be inserted into ATMs to withdraw cash in exchange for Bitcoins. wouldnt a bank be required to do the exchange? or is the atm owner a de-facto exchanger? does this require money exchanger license? This is unclear at present but as BTC is outside of the bank-issued sovereign currency parameters, I expect the owners of Bitcoin ATMs or banks which offer them will charge a fee for using the service, rather like in the days of traditional banking. This way, it is offered as a service rather than a financial transaction – they simply charge a few cents for using the machine..